Today's blog entry gives a brief overview of zeolite-based molecular sieves for physical adorption operations in the chemical process industry. Since the 1960s, molecular sieve adsorbents have become firmly established as a means of performing difficult separations, including gases from gases, liquids from liquids and solutes from solutions. They are supplied as pellets, granules, or beads and occassionally as powders. The adsorbent may be used once and discarded or, more commonly may be regenerated and used for many cycles over an extended time period. They are generally stored in cylindrical vessels through which the stream to be treated is passed. For regeneration, two or more beds are usually employed with suitable valving, in order to obtain a continuous process. As a unit operation adsorption is unique in several respects. In some cases, one separation is equivalent to hundreds of mass transfer units. In others, the adsorbent allows the selective removal of one component from a mixture, based on molecular size differences, which would be extremely unlikely to be performed by any other means. In addition, contaminants can be removed from fluid streams to attain virtually undetectable impurity concentration. Adsorbents may be used in applications for adsorbing a few grams to several tons. Before focusing on zeolite adsorbents, it is important to understand the two basic categories of adsorbents i.e. Amorphous and Crystalline. Amorphous Adsorbents: The amorphous adsorbents (silica gel, activated alumina, and activated carbon) typically have specific areas in the 200-1000 m2/g range, but for some activated carbons much higher values have been achieved (~1500 m2/g). The difficulty is that these very high area carbons tend to lack physical strength and this limits their usefulness in many practical applications. The high area materials also contain a large proportion of very small pores, which renders them unsuitable for applications involving adsorption of large molecules. The distinction between gas carbons, used for adsorption of low molecular weight permanent gases, and liquid carbons, which are used for adsorption of larger molecules as color bodies from the liquid phase, is thus primarily a matter of pore size. The division is somewhat arbitrary since it is really the pore size relative to the size of the sorbate molecule rather than the absolute pore size that governs the behavior. Nevertheless, the general concept is useful. In micropores (pores which are only slightly larger than the sorbate molecule) the molecule never escapes form the force field of the pore wall, even when in the center of the pore. Such pores generally make a dominant contribution to the adsorptive capacity for molecules small enough to penetrate. Transport within these pores can be severely limited by steric effects, leading to molecular sieve behavior. The mesopores make some contribution to the adsorptive capacity, but their main role is as conduits to provide access to the smaller micropores. The macropores make very little contribution to the adsorptive capacity, but they commonly provide a major contribution to the kinetics. Their role is thus analogous to that of a super highway, allowing the adsorbate molecules to diffuse far into a particle with a minimum of diffusional resistance. Crystalline Adsorbents: Crystalline adsorbents are the zeolites and zeolite analogues such as silicalite and the microporous aluminum phosphates. where the dimensions of the micropores are determined by the crystal framework and there is therefore virtually no distribution of pore size. However, a degree of control can sometimes be exerted by ion exchange, since, in some zeolites, the exchangeable cations occupy sites within the structure which partially obstruct the pores. The crystals of these materials are quite small (1-5 microns) and they are aggregated by a suitable binder (generally a clay) and formed into macroporous particles having dimensions large enough to pack directly into an adsorber vessel. Such materials therefore have a well-defined bimodal pore size distribution with the intracrystalline micropores (a few tenths of a nanometer) linked together through a network of macropores having a diameter of the same order as the crystal size (~1 micron). 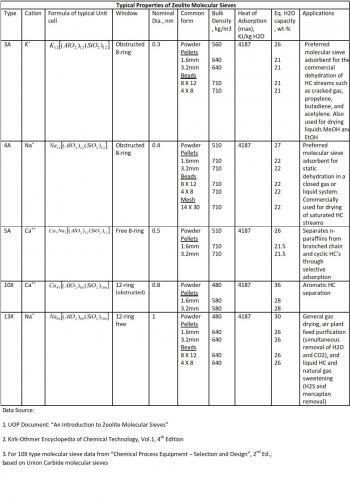 Here it is important to introduce "Desiccants" as a class of adsorbents and the following describes them. Desiccants: A solid desiccant is simply an adsorbent which has a high affinity and capacity for adsorption of moisture so that it can be used for selective adsorption of moisture from a gas (or liquid) stream. The main requirements for an efficient desiccant are therefore a highly polar surface and a high specific area (small pores). The most widely used desiccants are silica gel, activated alumina and the aluminum-rich zeolites (4A or 13X). The zeolites have high affinity and high capacity at low partial pressures. This makes them useful desiccants where a very low humidity or dew point is required. The micropores of 3A zeolite are small enough to exclude most molecules other than water. It is therefore useful for drying reactive gases. The major disadvantage of zeolite desiccants is that a high temperature is required for regeneration (>300 deg C), which makes their use uneconomic when only a moderately low dew point is required. Temperature Swing Adsorption (TSA) Process: A temperature-swing or thermal-swing adsorption (TSA) cycle is one in which desorption takes place at a much higher temperature than adsorption. The principal application is for separation in which contaminants are present at low concentration, i.e for purification. The TSA cycles are characterized by low residual loadings and high operating loadings. These high adsorption capacities for low concentrations means that cycle times are long, hours to days to months, for reasonably sized beds. This long cycle time is fortunate, because packed beds of adsorbent respond slowly to changes in gas temperature. A purge and / or vacuum removes the thermally desorbed components from the bed, and cooling returns the bed to adsorption condition. Systems in which species are strongly adsorbed are especially suited to TSA. Such applications include "Drying", "Sweetening", "CO2 removal", and "pollution control". A detailed description of the TSA process would require another blog entry and I end it with the description provided above. Drying: The single most common gas phase application for TSA is drying. The natural gas, chemical, and cryogenic industries all use zeolites, silica gel, and activated alumina to dry streams. Adsorbents are even found in mufflers. Zeolites, activated alumina, and silica gel have all been used for drying of pipeline natural gas. Alumina and silica gel have the advantage of having higher equilibrium capacity and of being more easliy regenerated using waste level heat. However, the much lower dew point and longer life attainable with 4A makes zeolites the predominant adsorbent. Special acid-resistant zeolites are used for natural gas containing large amounts of acid gases, such as H2S and CO2. The low dewpoint that can be achieved with zeolites is especially important when drying feed streams to cryogenic processes to prevent freeze-up at process temperatures. Natural gas is dried before liquefaction to liquefied natural gas (LNG), both in peak demand and in base load facilities. Zeolites have largely replaced silica gel and activated alumina in drying natural gas for ethane recovery utilizing the cryogenic expander process, and for helium recovery. The air to be cryogenically distilled into N2, O2 and argon must be purified of both water and CO2. This purification is accomplished with 13X zeolites. The 4A zeolite, silica gel, and activated alumina all find applications in drying synthesis gas, inert gas, hydrocracker gas, rare gases, reformer recycle H2. Cracked gas before low-temperature distillation for olefin production is a reactive stream. The 3A or pore-closed 4A zeolite selectively adsorbs water but excludes the hydrocarbons, thus preventing coking. It also prevents co-adsorption of hydrocarbons which would otherwise be lost during desorption with the water. Small pore zeolites are also applied to the drying of ethylene, propylene, and acetylene as they are drawn from storage. When industrial gases containing Cl2, SO2 and HCl are dried, acid-resistant zeolites are used. A relatively new application for zeolites is the prevention of corrosion in automotive mufflers. Sweetening: Another significant purification application area for adsorption is sweetening. 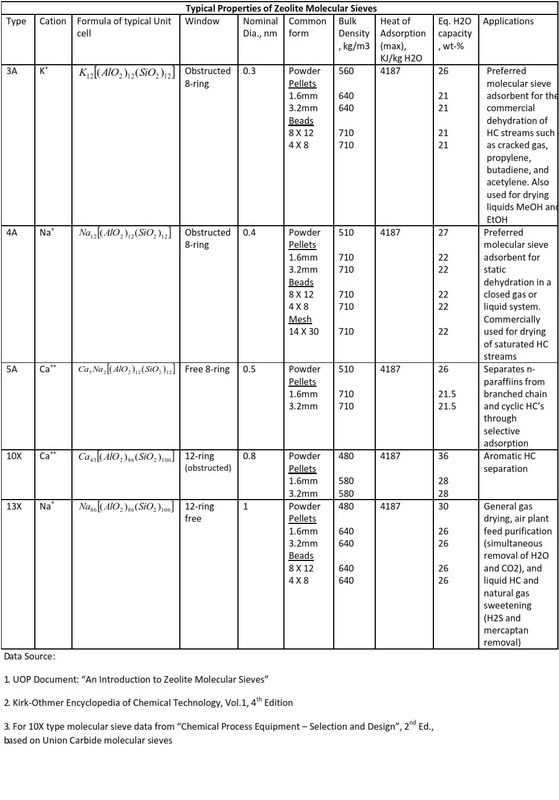 H2S, mercaptans, organic sulfides and disulfides, and COS need to be removed to prevent corrosion and catalyst poisoning. They are found in H2, natural gas, de-ethanizer overhead, and bio-gas. Often adsorption is attractive because it dries the stream as it sweetens. In the sweetening of wellhead natural gas to prevent pipeline corrosion, 4A zeolites allow sulfur compounds removal without CO2 removal (to reduce shrinkage), or the removal of both to upgrade low thermal content gas. When minimizing the formation of COS during desulfurization is desirable, calcium-exchanged zeolites are commonly used because they are less catalytically active for the reaction of CO2 with H2S to form COS and water. Natural gas for steam-methane reforming in ammonia production must be sweetened to protect the sulfur-sensitive, low temperature shift catalyst. Zeolites are better than activated carbon because mercaptans, COS, and organic sulfides are also removed. Many refinery H2 streams require H2S and water removal by 4A and 5A zeolites to prevent poisoning of catalysts such as those in catalytic reformers. Other Separations: Other TSA applications range from CO2 removal to hydrocarbon separations, and include removal of air pollutants and odors, and purification of streams containing HCl and boron compounds. Because of their high selectivity for CO2 and their ability to dry concurrently, 4A, 5A, and 13X zeolites are the predominant adsorbents for CO2 removal by temperature-swing process. The air fed to an air separation plant must be H2O and CO2 free to prevent fouling of heat exchangers at cryogenic temperatures; 13X is typically used here. Another application for 4A-type zeolite is for CO2 removal from base load and peak-shaving natural gas liquefaction facilities. Zeolites with high acid resistance, such as mordenite and clinoptilolite, have proven to be effective adsorbents for dry SO2 removal from sulfuric acid tail gas, and special zeolite adsorbents have been incorporated into the UOP PURASIV S process for this application. Zeolites have also proven applicable for removal of nitrogen oxides (NOx) from wet nitric acid plant tail gas by the UOP PURASIV N process. Mordenite and Clinoptilolite zeolites are used to remove HCl from Cl2, chlorinated hydrocarbons, and reformer gas streams. While making an attempt to make this blog entry as short as possible, I feel the information provided is a bare minimum to get an overview of how zeolite based molecular sieves are useful in adsorption processes. I look forward to comments from the esteemed members of the "Cheresources" community on this blog entry. A fine introduction to zeolites. Can we have a similar article on 'Pressure Swing Adsorption'? Good article of zeolite molecular sieve introduction! We are leading zeolite molecular sieve manufacturer in China. If you have any questions about molecular sieve, please feel free to ask me! Or send me mail info@psamolecularsieve.com. I will try my best to give my professional reply! I am working on a project dealing with (premature dégradation of molecular sieve ), i want to check the performance of this adsorbent, do i have to follow all steps of dyer sizing?, because i can't detect the main causes of this degradation. Please help me by giving me a simple method for checking. We are global manufacturer and supplier of molecular sieve packets and other desiccants like oxygen absorbers, silica gel packets etc. I want to remove H2S from biogas, which is having 0.2 % H2S and 40 % CO2. I need adsorbent, which is regenerable after it gets equilibrium. My doubt is that "will the concentration of H2S in gas stream affect the regeneration efficiency". Suppose, if the flow rate is 800 m3/hr with 2000 ppm, the regeneration is difficult than the same gas stream having H2S of 200 ppm. Is it like that? If it is Why?... Could you please explain me..